This is the second and final update of my GGGT 2014, summarizing what I learned in South Dakota and Utah. My parents, Grandpa Fagerland, and gravesite of Grandma Fagerland are in South Dakota. In Salt Lake City, I spent two days at the Mormon Church's Family History Library (FHL). Kaitlin at her great-grandmother's grave. She picked out the flowers. In South Dakota, I visited the gravesite of Loretta Meyer-Fagerland, my only deceased grandparent. My parents and my niece Kaitlin came along. I had visited Grandma's gravesite before in winter. I'd never been there in the summer. I wanted to add some nice summery photos to her FindAGrave profile, which I now manage. Here is a bonus picture that I didn't post to her website. At the FHL, I looked for answers about my 3rd-Great Grandparents (3GGP) Meyer. My 2GGF, Peter Meyer Sr., was born in Chicago in 1866. I have no idea who his father was (and only one clue about his mother). I was hoping to find documentation of his birth. At the FHL, I was informed that most Chicago records were destroyed in good old Mrs. O'Leary's fire of 1871. Chicago does have a book of "delayed birth records" for births that were not recorded immediately. There is a possibility that children born before the fire could have been re-documented afterward. It would be worthwhile to take a look at this log. The 1880 US census shows a Peter Meyer in Fond du Lac, WI. Though he had a somewhat common name, this one is likely to be my ancestor for multiple reasons. The census identifies Peter's mother only as "Christina Meyer," born in Germany around 1830. Her marital status was "widowed." Peter's youngest sibling was born in Wisconsin in 1873. According to this information, Peter's father must have died between 1872 - 1880, probably in Fond du Lac. I searched the Fond du Lac County death records and found no Meyer deaths in that time and place! It is possible that Peter's father died in a different county, or that the census was incorrect and he was still alive in 1880. Without any definitive clues, these 3GGPs remain unidentified. I visited Grandpa (Warren) Fagerland twice in Rapid City. I told him about the difficulty I've been having with his paternal grandparents, Ole and Mary Fagerland. I have never seen a picture of them, and I know next to nothing about Mary. Grandpa said that they actually lived in his family's house in their later years. He has vague memories of Ole living upstairs as an "invalid." (Ole died when Grandpa was 4; Mary died before Warren was born). I did not have any further luck tracing Mary's origins at the FHL. Our family tree only identifies her as "Mary Anderson." I know that she was born in Sweden in 1849 and immigrated in the 1860s. The Scandinavian experts told me that girls at that place and time didn't even have surnames until they married. The "Anderson" probably means that her father's last name was Anderson. If her father's first name were Anders, then she would be referred to as "Mary Andersdatter." Her first name would have actually been "Maria" in Sweden; "Mary" was an Americanization. I have seen clues about who her parents might be, but nothing very definitive. I could not find Swedish birth or immigration records that even match her first name and birth date. I have found no documentation of Ole or Mary in the US before the 1900 census, when she was using her married name. Grandpa remembers seeing pictures of his grandparents as a kid. The family used to talk about the picture of Mary because she looked native American. In that particular picture, she was seated and "stooped over like an Indian squaw," with a shawl draped over her shoulders. She must have had dark hair to give that impression. Unfortunately, Grandpa believes that his family's pictures were destroyed in their house fire of 1931. If this is true, it could be that our only chance of finding a picture of Ole and Mary would come from distant cousins, descendants of Knut's brother or sister. "Knut ... came to Upland Township in 1905. Mrs. Fagerland was organist at the Little Bethany Church where their marriage ceremony was performed. Mrs. Fagerland worked in Kermit in the hotel which was owned by a Mr. Stanton, during the periods when she was not needed on her claim." (Note: Mr. Stanton's son, whom Great-Grandma baby-sat, became governor of Washington). "Knut shipped his possessions by immigrant car to Tioga. He later hauled his lumber for his shack from Flaxton. Knut was appointed as the first clerk when the school district was organized and took the census of the children which numbered about 70 between the ages of 6 and 20. He was appointed treasurer when the town board was organized. "At one time a fire started by hunters near a lake on his homestead burned as far south as Hamlet. He piled wet manure around his barn and hay stack and saved them from burning. "Knut's sister, Hannah, homesteaded in the fall of 1906 on Sec. 13 and 14 of Upland Township. She later married Otto Iberg; they had two children, Reuben and Gladys. Gladys died at the age of 6 months. Otto, Hannah and Reuben are now all dead." This passage does not indicate if Hannah had grandchildren or if her line has died out. I seem to remember my Washington cousins talking about Iberg relatives. Knut also had a brother Martin and a sister Elizabeth. Elizabeth was estranged from the family. My great-aunt Deloris discovered Elizabeth's descendants in Olivia, MN in the early 2000s. I don't know anything about Martin's family. Reading this and other passages, I am confused about the Fagerland house and the natural disasters. In his memoir, Warren wrote that the house that survived the tornado of 1919 is still standing. However, he also says that the fire of 1931 burned the house down. Were there two houses? If so, it does seem possible that family photos survived, maybe to end up in Deloris's possession. Fortunately, I did have success tracing Beck lineage at the FHL. My Grandpa (Rallan) Beck's father's father was August Beck. He is well-remembered, but he came to America alone and his origins seemed to be lost. It was only a year or two ago that Grandma Beck told me, "Nobody knows where August came from." My genealogist relatives and I continued to chip away at this stubborn piece of the puzzle. 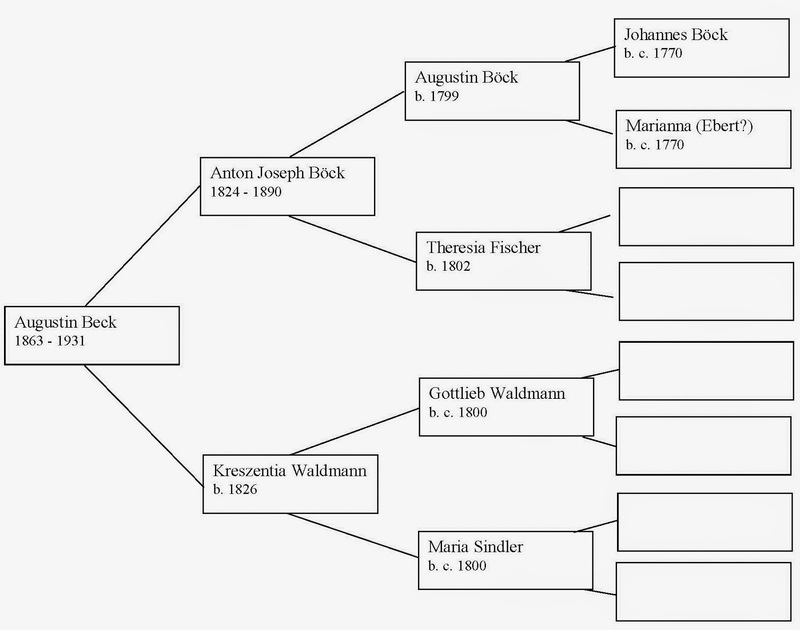 By this spring, we had identified August's father as Joseph Anton Boeck. (Also spelled "Bock" with an umlaut over the o). We saw a handwritten entry for August's mother's name, though it was difficult to read. By the end of my visit to the FHL, I had secured the identity of August's mother, all four of August's grandparents, and two of his great-grandparents! Our family name was spelled "Boeck" until August immigrated to America and changed it to "Beck" in the 1880s. His family was from the German villages of Rettenbach, Remnatsried, and Frankau. Those locations are pinned here, and you can see how close they were to Munich (scroll out and look northeast). It is fair to assume that Munich, ND was probably named by Germans from the Munich region of Bavaria. The Becks may have been following neighbors in a migratory wave from Munich, Germany to Munich, ND. August's family tree is summarized below. I'm sure that the FHL records continue further back than this. This was just as far as I was able to go with the time I had in Utah. I now know how to order the library's microfilms for local research. I'll be posting more complete details and updates at my official family tree website. I may also write a follow-up post about how I discovered these facts. The detective work in itself was as interesting as the results.